Launching in summer 2018, the Endemic Galapagos Catamaran, custom designed especially for cruising the azure waters of the Galapagos Islands, will be one of the most modern and luxurious ships in the archipelago. Spacious, comfortable, steady and eminently seaworthy, the Galapagos Endemic will set the new standard for luxury catamarans in its class. The Endemic, for example, features computers for guest use, flat screen tv in the briefing area and passengers lounge, Blu-ray player and air conditioning for hot days. A typical day on a luxury Galapagos yacht like the Endemic might include a morning expedition to a visitor site to see Frigate Birds, Blue-footed Boobies, sea lions, tortoises, iguanas or Galapagos Penguins, followed by a delicious lunch on board, an afternoon trip to a spectacular snorkeling spot and then another gourmet meal for dinner. Cap this off with a cold drink on the deck while watching a dazzling sunset and you have the perfect Galapagos day! Anewcomer to the archipelago, the Petrel Galapagos Catamaran is a luxury cruise named after a common sea bird in the Galapagos, following the same traits and behavior, cruising swiftly with elegance, and silent at sea. 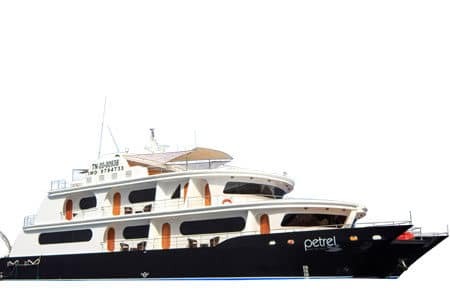 The Petrel was built with comfort and stability as primary features, and is equipped with spacious lounge areas, large cabins and Jacuzzi. Far reaching itineraries feature comprehensive programs that cruise the center-west, and south-north islands in the Galapagos. Modern interiors with customer-centric staff sets the perfect mood for an unforgettable experience. Petrel Galapagos Catamaran showcases close encounters with untamed wildlife in a remarkable ecosystem that doesn’t cease to amaze all guest coming across its shores. 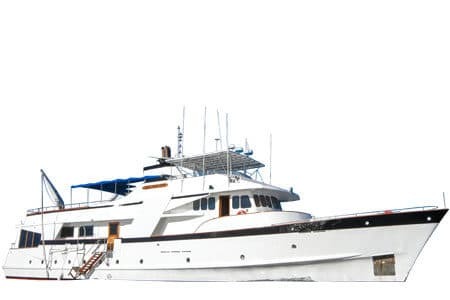 The Millennium Galapagos catamaran is an elegant and spacious catamaran with many years of operation in the Galapagos. Spacious cabins with large windows, balconies with ocean views and many common areas are only but a few of the features the millennium has to offer guest onboard. 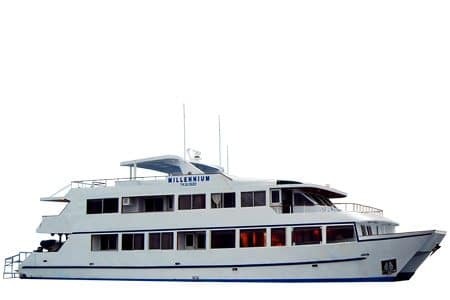 Despite her size, the millennium only offers accommodation for a small group of 16 guests, providing a private atmosphere in the seclusion of the Galapagos Islands. Feature rich programs showcase the islands in a variety of lengths, suitable for those looking to reach certain parts of the islands or extended cruising. The Galaxy II Eco Galapagos Catamaran is the newest addition to sustainable cruising in the archipelago, environmentally friendly with a low carbon footprint and efficient fuel consumption. A modern vessel catering fine cruising with generous interiors for 16 guests that will be part of a unique customer-centric experience. 8 fully equipped furnished cabins are available in main and upper deck, accommodation comes in twin and double sized beds. An inviting and intimate environment aboard the Galaxy Eco II Galapagos Catamaran guarantees you encounter the islands in its purest form. A rich independent travel with comprehensive programs ranging from 4 up to 15 days ensures the perfect amount of time for guest individual needs. 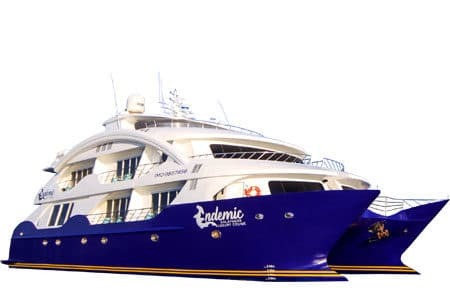 The Eden Galapagos yacht cruises the islands in comfort taking guests to remote parts of the islands. Sister to the Aida Maria, they both carry similarities; both in services and amenities. A stylish cruise with eight double cabins, most of them featuring lower twin beds. Spacious lounge areas and a spacious sundeck provide guests with exceptional comfort while cruising the islands. Extensive itineraries include Genovesa and Fernandina, along with more popular ones found in southern islands; providing flexibility and variety to their programs. 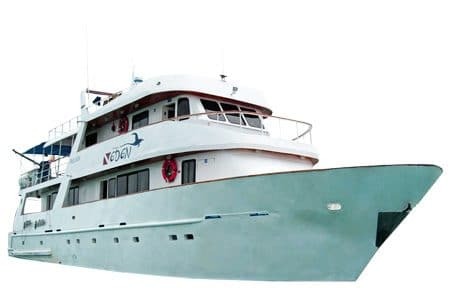 Often praised as the perfect balance between comfort and price; the Eden Galapagos Yacht is sure to appeal to a wide range of travelers. 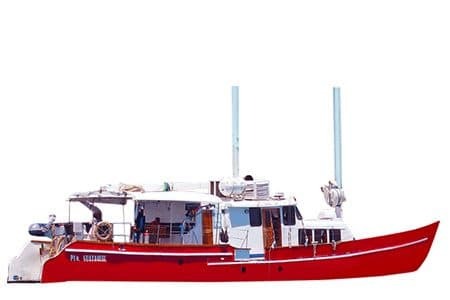 The Encantada Galapagos sail boat is a beautiful and charismatic red schooner, popular for its small size that can accommodate up to 12 passengers. It provides guests with a unique personalized service, enhancing their cruising experience. On board services are limited, but available staff will go above and beyond to make guests feel at home. A seamless tour while exploring the islands, the perfect fit those looking for a small group. The smallest yacht we currently offer in the islands, the Encantada has tailored extensive and complete itineraries covering the most relevant and best islands in their 5 & 6-day programs, or all inclusive when combined for longer itineraries. The Santa Cruz 2 Galapagos Ship succeeds its predecessor with the highest standards in sustainability and comfort. 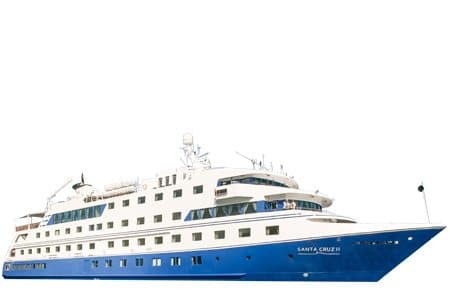 Leading with decades of experience, exceptional guided expeditions and the utmost care for the delicate Galapagos ecosystem guarantees unrivalled experiences for guest aboard the Santa Cruz. Chic interiors and 5 spacious decks with a unique approach of stylish simplicity, the Santa Cruz 2 Galapagos ship emanates a luxurious ambience; whilst showcasing breathtaking views of the surroundings. Hosting up to 90 guests, the Santa Cruz 2 features a variety of cabin layouts which include singles, twins, doubles and triples. Interconnected cabins are available for families, and Darwin Suites offer a higher standard of comfort. Itineraries are available in 5 & 6-day programs, excursions that take guest to the Northern, Eastern & Western islands of the Galapagos. The Ocean Spray Galapagos Catamaran carries prominent traits surpassing the standard comfort and intimacy found among other vessels in its category. An elegant design featuring a large sundeck, Jacuzzi, and spacious cabins all carrying their own private balcony with panoramic windows. Experience smooth cruising to remote locations in the Galapagos Islands with speed and stability, truly an outstanding experience. Itineraries have been carefully put together providing great variety in their programs- and let’s not forget a welcoming crew with top quality guides, and a chef catering local and international cuisine. Other services and amenities worth mentioning are – interior / exterior bars, all fresco dining, and the use kayaks, snorkeling & wetsuits at no additional cost. 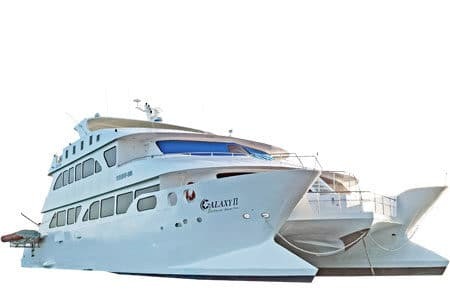 The Galaxy Galapagos Yacht is a first-class cruise excelling in its category with a top of the class onboard facilities, a seamless live-aboard experience while cruising the islands! 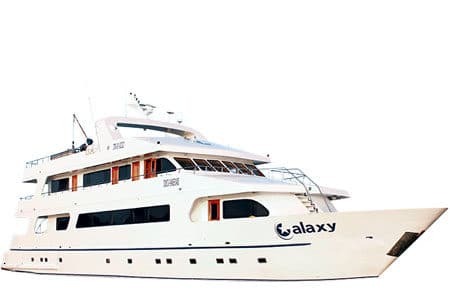 With a 16 passengers capacity, the Galaxy Galapagos Yacht provides guests with a unique first-row experience to the Enchanted Islands. Carefully distributed cabins across three decks; featuring twins and doubles can offer accommodation to a variety of guests. Common areas include a spacious dining area, interior bar, exterior sitting areas, Interior lounge salon with a flat screen and a sundeck in its 4th upper deck for panoramic indulgence. Itineraries are available in 5, and 6-day feature packed programs, including the best and must see Islands. A combination of programs is recommended for an extensive discovery of the Islands. 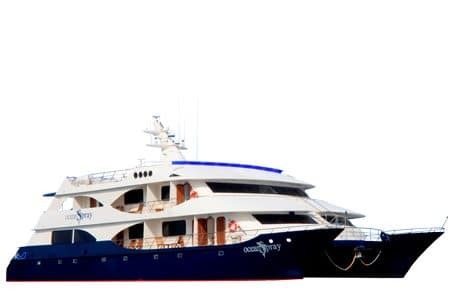 The Beluga Galapagos Yacht is a modern vessel with excellent onboard facilities. Large wooden interiors and carpeted floors provide guests with great comfort while cruising the islands. Spacious external lounge areas and a sun deck are available for enjoyment of the Galapagos Islands and leisure. Beluga holds a variety of cabins available, from a triple (a rare commodity in Galapagos Yachts) to standard doubles and twins. Outstanding itineraries will take guests through remarkable and must see stops in the islands. Programs ranging from 4 to all inclusive 15-day tours. Exclusively outfitted to cruise the archipelago and awarded with the Smart Voyager certification for adhering to conservation standards. The Beluga Galapagos yacht also complies with international maritime regulations and is SOLAS certified.